· Digitize the original negative, slide, or document when possible, and a copy as close to the original as possible when the original is not available. · Use an air blower to blow dust off the item being scanned and off the scanner. Keep the scanning bed clean and do not let fingerprints get on the main surface of photographic materials. · Best practice is to save archive master images in uncompressed TIFF format. High quality JPEG can also be used if the image is from a camera that does not produce TIFF or if storage space is limited, particularly for documents with hundreds or thousands of pages. · Good practice is to use the default sRGB color space for color images and use whatever is the default color space for grayscale images. Best practice is to use Adobe RGB (1998) color space for color images and Grayscale Gamma 2.2 for grayscale images, and to carefully manage working color space on all equipment and software. · The automatic default image adjustments for scanners should be turned off or modified for archival scanning. Special handling of tone and color adjustments is needed for historical projects. · Good practice is to digitize typical photographs at 3000 pixels on the longest side. Best practice is 4000 pixels on the longest side. The best practice is recommended for images with much detail such as aerial photographs or photographs inside a store. Greater resolution than these may be appropriate for large originals, particularly for negatives. The default display size of the master image should match the size of the original item. · Good and best practice is to create master images that have 8-bits grayscale or 24-bits color with the major adjustments to tone and color done with 16 bits per channel. Alternative best practice is 16-bits grayscale or 48-bits color for the master images, particularly when extensive editing of tone and color will be done later. · For paper and other reflective items, most recent scanners can produce adequate archival images. For medium format film a mid-level consumer grade scanner can produce adequate images for good practices. For 35 mm negatives or slides a more expensive scanner is needed and available flat bed scanners cannot meet the criteria for best practices. · A digital camera used with a copy stand or book cradle is a good option for digitizing items that are too fragile or too large to scan. The camera should be an SLR or have a similarly large sensor. An archival master image should be made with the assumption that it will be used for many purposes and the original item may not be available in the future. Archival images should be of sufficient quality for virtually any use, as well as in a format that will be reliably accessible at least 50 years in the future. Fortunately, the methods for creating adequate archival images are well developed at this point. This Chapter is based primarily on three widely used best practice documents and my experiences working with those documents. The three documents will be referred to as the 2003, 2008, and 2010 best practices documents. The 2003 document (Western States Digital Standards Group, 2003) and 2008 document (BCR, 2008) were developed by a collaborative effort among many different historical institutions in the western U.S. The 2010 document (Federal Agencies Digitization Initiative, 2010) was developed by U.S. government agencies. The guidelines presented in these documents have changed significantly over the years as technology advanced. The results of these changes include much larger archival files. With the 2003 best practices the file size for an individual photograph would typically be in the range of 6 MB to 50 MB. With the 2008 best practices the typical file size would be in the range of 21 MB to 256 MB. The 2008 document points out that the newer recommendations may not be optimal for all situations. Many individuals and organizations will want to consider whether the benefits of using the later best practices are worth the costs. My experience has been that the later best practices have no noticeable benefit in many common situations. The general approach taken in this Chapter is that the 2003 guidelines, with some modifications, provide “good practices” and the later guidelines provide “best practices.” The 2010 best practices document uses a similar strategy of presenting recommended best criteria and less expensive alternative criteria that are similar to the 2003 guidelines. The good practices are adequate for some archive projects and require minimal effort and expense. This Chapter summarizes technical guidelines for making digital images. Chapter 3 describes the basic methods for making adjustments to tone and color consistent with the guidelines in this Chapter. Appendix B and the Guidance on Using Scanning Software at http://archivehistory.jeksite.com/chapters/scan_part1.htm provide information on implementing the guidelines with different scanning software. This Chapter initially focuses on using scanners to make digital images. A later section in the Chapter discusses using cameras to create the images rather than scanners, and Appendix D describes the specific steps for using cameras. The order that topics in this Chapter are discussed is based on introducing and explaining the topics and is not the order of actual workflow when digitizing. The appendices and Guidance on Using Scanning Software describe the actual workflow for scanning. · Good practice is to make an archival digital copy of a historical item from the best source that is currently available. · Best practice is to exert some effort to obtain and digitize the original negative, slide, or document when possible, or a copy as close to the original as possible when the original is not available. A digital image made from an original negative, slide, or document typically has significantly greater clarity and detail than a digital image made from a paper print or copy. For paper and film materials, each generation of copying causes significantly reduced detail. If the original item cannot be obtained, try to find a print or copy that was made directly from the original source. When a negative is found, make sure it is the original negative not a copy negative from a photograph of a photograph. Prior to digital cameras, a copy of a paper photograph was often made by taking a photograph of the paper photograph. Digital images made from these photographs of photographs typically have significantly less clarity and detail than a digital image made from the original paper print. The safest practice is to make a digital image of the best version that is currently available and replace the image later if a better source is found. · Good practice is to carefully handle historical items by their edges to avoid damage from fingerprints, use an air blower to remove dust from an item, and use the air blower and a lint-free wipe or cloth to clean the scanning bed before scanning. · Best practice is to wear cotton or latex gloves when handling historical items, use an air blower and when needed a carefully selected and maintained soft brush to remove dust from an item, and use the air blower and a lint-free wipe or cloth to clean the scanning bed before scanning. Fingerprints are a significant threat to photographic materials and can be very difficult to correct. Figure 2.1 is an example of the long-term effects of fingerprints on a photograph. The fingerprints in the sky by the chimney and at the bottom in the center significantly detract from the photograph. The fingerprint in the sky could easily be removed with image-editing software; however, the fingerprint at the bottom extending up the side of the house would be difficult to remove without compromising the content of the photograph. Fingerprints may not manifest in photographic materials until long after the actual incident of touching the surface. Figure 2.1. 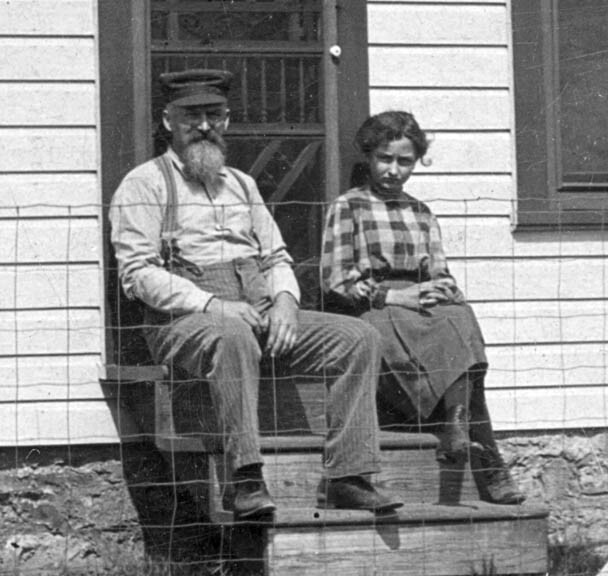 Photograph of Alexander Switzer and his daughter Ethel sitting on the steps of the first house in Yoder, Kansas. Note the detrimental effects of fingerprints at the top and bottom center of the photograph. This photograph was one of several taken in 1909 by an unknown photographer at the initiative and expense of Alexander Switzer. It was published in August, 1989 in a publication for the Yoder Centennial, which makes copyright held by Switzer’s heirs through 2047. Permission has been granted for this digital image and works derived from it to be used by anyone and for any purpose. Historical items should be handled in a way that avoids direct contact with the main surface of the item. By far, the safest practice is to wear gloves while handling historical items. The two most common gloves for historical work are lint-free white cotton gloves that can be obtained from a photography store or on the internet and latex or vinyl examination gloves from a drug store. Cotton gloves can be washed with unscented detergent and reused. Even with gloves, photographs and particularly negatives should be handled by the edges whenever possible. Gloves also avoid fingerprints and smears on the glass bed of a flatbed scanner. I use a 3 by 5 inch card to lift the corner of the item being scanned when removing it from the scanner surface. That is particularly helpful with cotton gloves that cannot easily grasp a piece of paper on glass. I also use the card in order to avoid touching the scanning bed when I’m scanning non-historical documents without using gloves. Dust on historical items and scanning beds can significantly reduce the quality of an archival image. Dust is most noticeable on small items that are greatly enlarged, such as slides. Dust is inevitable and can be reduced but not eliminated. The first step in removing dust is to blow air on the item being scanned and on the scanning bed. The Giottos large Rocket Air Blaster is an inexpensive popular and powerful hand air blower bulb. Canned aerosol air blowers are another option; however, they can be difficult to control and must be replaced when empty. Also, some people have reported damage from propellants being discharged from aerosol blowers. Blowing with human breath is not acceptable due to moisture and potential contaminants. For historical items, a good hand blower bulb will remove any dust that can be blown away without a blast of air that could threaten fragile items. Carefully maintained soft brushes for photographic uses are another option for removing dust. An antistatic brush may remove some dust that an air blower does not remove. The brush should have a protective container and be handled carefully to avoid contact with potential contaminants, including human skin. Brushing a slide or negative should be gentle and slow, particularly on the emulsion side (the dull side). The U.S. National Archives (1998) specifies that brushing or dusting be done from the center of the item outwards. That strategy can be very useful for slides because slides tend to accumulate particles along the edge of the mount. Brushing across the slide can move particles from the edge onto the face of the slide. There are expensive brushes that have slight radioactivity that is claimed to reduce static electricity; however, most direct comparisons of these with less expensive brushes report little or no difference. My usual practice is to blow air on the item being scanned and then blow air on the specific area of the scanning bed where the item is going to be placed. For paper photographs and medium format negatives I rarely use a brush. In general for negatives and slides I try to avoid any direct physical contact with the surfaces of the film, including brushing. However, 35 mm negatives and slides are particularly prone to dust artifacts and sometimes brushing is useful after blowing has been done. When beginning a scanning session I wipe the scanning surface with ultra soft lint-free nonabrasive wipes to remove dust and any fingerprints. In the rare case that there are particles or smears that remain after this wiping, I use a cleaning cloth and cleaning spray designed for LCD screens and other optical surfaces. Some authors suggest running a HIPPA air purifier in the room where scanning is being done. That may be useful if significant additional dust is contaminating the surface at the time of the scan. In my experience, the new dust for historical items is minor compared to the dust that is already stuck to the items from previous handling and exposure. · Good practice is to make the archived master images in uncompressed TIFF, or high quality JPEG if the original digital image is from a camera that does not produce TIFF or if storage space is limited, particularly for documents with many pages. · Best practice is to make the archived master images in uncompressed TIFF. The standard format for archiving master images is uncompressed TIFF. It is virtually certain that TIFF files will be universally accessible for more than 50 years in the future. TIFF is a lossless format that does not involve any degradation of the quality of the image. These files have a file name extension of .tif on a Windows computer. There are a few methods to compress TIFF files without loss of quality (e.g., LZW); however, uncompressed TIFF is more reliable over the long-term and is the standard format for master images in digital archives. Compression of TIFF files may be appropriate for working or intermediate files as a copy of an image is prepared for printing or display. Any scanner should be able to produce TIFF output files. As discussed later in this Chapter, the JPEG format may be appropriate for master images in certain situations. However, the JPEG format compresses the image and produces slight degradation each time the image is modified and re-compressed. Repeated editing of an image can cause significant degradation with JPEG. If a camera that does not provide TIFF files is used for digitization, high quality JPEG output files may be used as the master images rather than converting the JPEG files to TIFF. However, when the master images are modified to create working images, TIFF should be used for the working images. JPEG files may also be used for master images if digital storage space is a limitation. For example, images of documents that have hundreds or thousands of pages will require large amounts of storage space. The JPEG format can be used in these cases and is very safe for documents with clear writing that will not be affected by slight degradation. The PDF format is increasingly used to share and store electronic documents, but the best practices documents recommend TIFF or possibly JPEG for master images from scanners. Typically, PDF files from scanning are basically images in compressed formats with parameters that are not easily understood or controlled. Documents archived as TIFF or JPEG files are much more reliably understood and controlled, and more easily adjusted or enhanced later. Also, my experience in the past few years has been that glitches due to inconsistent implementation of the PDF format occur too frequently. Archival master images that need to be reliably accessed 50 or more years in the future are best handled at present with TIFF or JPEG. As discussed later in Section 2.18, PDF may be appropriate for archiving documents created directly from word processing software rather than from scanning. PDF files from word processing contain the text and format specifications, whereas PDF files from a scanner are images of the pages. · Good practice is to scan black and white photographs in grayscale and color materials in color. The use of color is optional for sepia photographs and for black and white photographs with damage that has color. · Best practice is to scan black and white photographs in grayscale and color materials in color. The use of color is expected for sepia photographs and for black and white photographs with damage that has color. Scanners usually have three possible modes for handling color in images: color, grayscale, and black and white. Grayscale refers to the typical black and white photographs that have continuous shades of gray between the extremes of black and white. On scanners, black and white mode usually refers to images that have only pure black or pure white with no shades of gray. In theory black and white mode can be used for things like typing on white paper. However, I have consistently found grayscale images to be significantly better than black and white mode in virtually all situations and no longer attempt to use black and white mode. The choice between scanning in color or grayscale is usually straightforward based on the characteristics of the source item. There are a few cases that require some judgment in deciding whether to use grayscale or color. One case is when a black and white photograph or document that would normally be scanned as grayscale has damage that has color. Typical situations are brown or yellow spots or stains. In these cases, scanning in color makes the damage easier to recognize and much easier to correct later if desired. Another case is sepia photographs that are basically black and white photographs with a brown tint. Scanning these as grayscale will not lose content, but scanning in color more accurately represents the original state of the photograph. As discussed in the later section on bit depth, grayscale images are usually used when appropriate because the computer file size for a TIFF grayscale image is one-third the size of the same image in color. Writers sometimes recommend that images be scanned in color and then converted to grayscale utilizing image-editing software such as Photoshop. This provides more sophisticated options for the conversion and is usually recommended for artistic creativity. However, for historical items, the originals are monotone (grayscale or tinted grayscale) and the conversion during scanning produces good results. If more sophisticated methods for conversion to grayscale are needed for a historical image, the master image would be best kept in color. 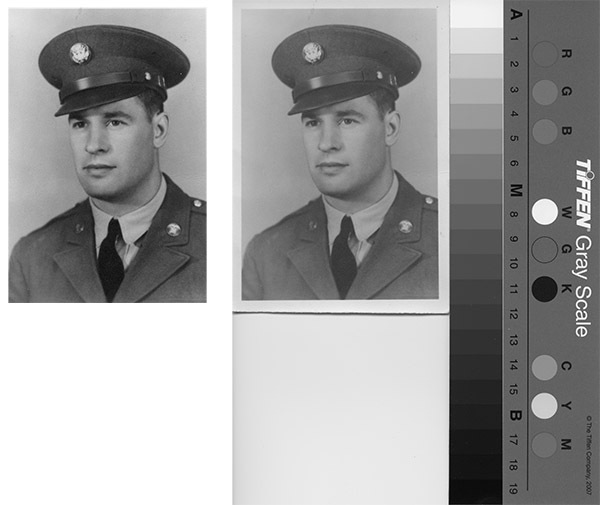 Chapter 5 discusses various methods for converting color master images to grayscale. · Good practice is to use the default sRGB color space for color images and similarly use whatever is the default color space for grayscale images. The master images should have an embedded profile and/or the EXIF color space field properly set. · Best practice is to use the Adobe RGB color space for color images and the Gray Gamma 2.2 color space for grayscale images. Color space must be carefully managed throughout all image capture and processing. The master image should have an embedded profile and preferably also have the EXIF color space field properly set. The working color space determines the range of colors that can be processed and output for an image and how the numbers in a computer are mapped to colors. The usual default color space for scanners, cameras, image-editing software, and commercial photo printing is sRGB. The sRGB color space is optimized for display on a computer monitor and has a relatively narrow range of colors. The most widely used alternative is Adobe RGB (also called Adobe RGB 1998), which has a broader range of colors that are optimized for printing. Better quality software implements color management that specifies the working color space and assigns information for it in the output file. This allows the working color space to be handled properly in later processing and printing. Color management is discussed in Appendix A. In practice the actual differences in possible colors between sRGB and Adobe RGB color spaces are not large and are relevant only in certain situations. The greatest differences are that Adobe RGB has more colors in the blue-green range and in the light orange-yellow range. These differences are most relevant for images of natural settings with green vegetation and colorful sunsets. However, even in these cases very good images can be made with the sRGB color space. Also, for historical images the range of colors is limited by fading and the limitations of past technology. Information about the working color space needs to be encoded in the master images. The images will not be processed and displayed properly if an incorrect color space is used. Images made with the Adobe RGB color space appear flat and washed out if they are printed or displayed as if they were sRGB images. Similarly, images with the sRGB color space are significantly over saturated if they are printed or displayed as if there were Adobe RGB. As described in Appendix A, color space information can be encoded in image files in two ways. The color profile can be embedded in the image file and the color space field can be set in the internal EXIF documentation fields in an image file. Image-processing software uses the embedded profile, but the EXIF fields are much more accessible to users. As discussed in Chapter 5, images made with the Adobe RGB color space need to have a copy with the color space converted to sRGB for use on the internet and for most commercial photo printing. Most software for displaying images and most commercial photo printing services assume and correctly handle only the sRGB color space. High-end inkjet photo printers can utilize the wider range of colors in the Adobe RGB color space. Using the Adobe RGB color space adds other complications to image processing. The default assumption to use sRGB is built into equipment and software, and has to be carefully managed. To properly maintain the Adobe RGB color space, the color space handling needs to be carefully set and monitored at every step of image processing. Some scanners and software put no information or incorrect information about working color space in the output file. Several examples are described in Appendix A and Appendix B. Tracking down these types of problems can be very time consuming and virtually impossible unless certain software described in Appendix A is used. In general, the effort to use Adobe RGB will do more harm than good if color management is not carefully implemented at every step. Both the sRGB and Adobe RGB color spaces are expected to be properly handled by software 50 years in the future. However, other less common color spaces that are sometimes recommended have a much higher probability of becoming obsolete. The 2010 best practices document recommends Adobe RGB as the preferred working color space for master images and sRGB as an acceptable alternative. The 2008 document provides only the general recommendation that a “large color space” be used. The 2003 document does not address color space. Various color spaces are available for grayscale images but I have never encountered noticeable problems from inconsistent color spaces with grayscale images. The grayscale color space Gray Gamma 2.2 is recommended for computer display and inkjet printers. The color space Dot Gain 20% is optimized for a printing press and is the default in some software. The 2010 best practice document recommends Gray Gamma 2.2 for archiving grayscale images. · Good practice is to digitize typical photographs at 3000 pixels on the longest side, or with greater resolution as indicated in the tables below. The default display size for scanned images should be the same size as the original item, including for film. · Best practice is 4000 pixels on the longest side, or with greater resolution as indicated in the tables below. The default display size for scanned images should be the same size as the original item, including for film. Minimum resolutions of 600 to 800 ppi are appropriate for sharp, high detail images such as aerial photographs. 1 The sizes of the originals are based on the actual image dimensions excluding any borders and mounts. 2 The column for best practices is particularly appropriate for important images with much detail such as aerial photographs or photographs of merchandise in a store. The good practices may be appropriate for simpler images or when the original is not sharp. 35 mm film or smaller. 35 mm negatives are about 1.4 inches on the longest side and slides about 1.3 inches. Medium format negatives about 2.2 inches on one side. The other dimension may be about 2.2 inches, 3.3 inches, 4.2 inches, or some other length. Large format film, 4 x 5 inches to 8 x 10 inches. Greater resolutions may be useful for high detail images. 3 Minimum ppi is specified for medium format negatives because the long length relative to width for some of these films produce results that are not optimal with a simple specification of pixels on the longest side. The ppi criteria were set based on my experience with different resolutions for relatively high detail images. The best practice documents recommend that the default width and height of the master images be set to exactly match the size of the original item, even when the originals are slides or negatives. This provides historical accuracy and does not affect the quality of the final printed or displayed image. Software for browsing, editing, and printing the image can easily modify the size of the output image later when a different size is wanted. Matching the original size is easy when scanning. Images from cameras will not match the original size unless the size is set with image-editing software. The spatial resolution of a digital image is the number of pixels per inch (ppi). A pixel is a tiny rectangle that is set to one color and is the smallest detail that can appear in a digital image. The term dots per inch (dpi) is often used interchangeably with pixels per inch. The resolution and overall size of an image determine the total number of pixels on each side. For example, scanning a 4 inch by 6 inch photograph at 500 ppi produces a digital image with 2000 pixels on the 4 inch side and 3000 pixels on the 6 inch side. The total number of pixels on the sides of an image determines what level of detail is recorded in the image and how much the image can be enlarged. Detail in an image includes such things as letters on signs or calendars in the background, labels on merchandise in a store, and the characteristics of buildings in an aerial photograph. Great enlargement of the image is needed to see the information in these details. In addition, enlargement may be needed for display. With extreme enlargement, pixelation occurs when the individual rectangular pixels become visible and the image no longer looks natural. Higher resolution is needed to avoid pixelation with great enlargements. Of course, the size of the image files also becomes larger with greater resolution. The maximum size an image can be printed is determined by the total number of pixels on a side. General guidelines are that digital images produce excellent results when printed at a size that has 300 ppi and acceptable results when printed at 150 ppi. For example, a digital image that has 3000 pixels on one side will have 300 ppi when printed with that side 10 inches long. At 150 ppi, that side of the print will be 20 inches (3000 pixels / 150 ppi = 20 inches). If the same image is created with a higher resolution that has 4000 pixels on the side, then it can be enlarged to 13 inches and still have 300 ppi for an excellent print. Specifying the total number of pixels on the longest side of the image is the easiest way to set criteria for making digital images. The actual resolution (ppi) used to create the digital image is determined based on the size of the source item. For example, an 8 by 10 inch photograph needs to be scanned at 300 ppi to make a digital image with 3000 pixels on the longest side. However, a 35 mm slide needs to be scanned at about 2300 ppi to achieve 3000 pixels on the longest side (because the slide is about 1.3 inches on the longest side). A greater number of pixels are appropriate for photographs with more detail. The amount of detail depends on the content of the picture and on the type and size of the original. An aerial photograph has more detail than a simple portrait and is more likely to be examined with great enlargement. In addition, original negatives and slides hold more detail than paper prints made from them, and larger photographs can hold more detail than smaller ones. Medium format negatives typically capture more detail than 35 mm negatives or slides. A 35 mm negative or slide typically holds more detail than an 8 by 10 inch paper print, and an 8 by 10 inch paper print holds more detail than a smaller print. In general, resolutions greater than 800 ppi will not increase the amount of useful detail in digital images of paper photographs. However, higher resolutions may reduce pixelation with enlargement when the original photograph is small. For negatives and slides, the maximum useful resolution depends on the speed and grain of the film, the quality of the camera lenses, and the skills of the photographer. For medium format negatives, a resolution greater than 1200 ppi will rarely have increased useful detail for historical photographs by amateur photographers. The variability of images with 35 mm film is so great that I have not found a simple rule of thumb. Scanning an item with different resolutions and then comparing the amount of detail is a useful learning experience. For example, direct comparison of letters that can only be read at high enlargement shows when improvement does and does not occur. Table 2.1 above gives the resolutions for good and best practices for scanning typical paper photographs and other reflective materials such as tintype photographs. These are photographs that are 10 inches or less on the longest side. The resolutions that will be used for different sizes of photographs are given in the table. When the longest size of a photograph is between the resolutions given in the table, an intermediate resolution can be calculated, or the higher resolution can be used. For example, using the good practice column, a photograph that is 5.5 inches on the longest side can be scanned at 600 ppi, which is the resolution for 5 inches. The column for best practice in the table is particularly appropriate for important images with much detail such as photographs inside a store. Those wanting to minimize storage space and scanning time may use the good practices for less detailed images or when the original is not sharp. Table 2.2 above gives the resolutions for good and best practices for negatives and slides, and for large paper photographs. For important high detail images with these types of originals, the safest practice is to make and compare images at different resolutions to be sure that detail is adequately captured. Some writers recommend that scanning only be done using a native or hardware resolution of the scanner, but the best practices documents used here recommend using other resolutions. Scanners typically have certain resolutions that are native or built-in. For example, a flat bed scanner may have native resolutions of 300 ppi, 600 ppi and 1200 ppi. If a resolution of 400 ppi is wanted, the scanner will use 600 ppi and then mathematically calculate or interpolate to produce 400 ppi in the output file. Some writers argue that a calculated result is less accurate than using a native resolution. My explorations of both methods have found that any differences are negligible when compared by careful visual examination, evaluation of effective resolution as described in Appendix C, or the precise comparison of edges and color using the method described in Appendix A for comparing rendering intents. The calculation process may take somewhat longer than scanning with a native resolution. · Good practice is to make a master image that has tone and color carefully adjusted to correct fading and exposure. The darkest and lightest tones in an image should not be set to pure black and pure white. If these darkest and lightest tones are set quantitatively, a typical photograph with tones ranging from 0 for pure black to 255 for pure white will have the darkest tones in an image set to about 4 or higher and the lightest to about 251 or lower. · Best practice is (a) to make a master image that has tone and color carefully adjusted to correct fading and exposure, or (b) to make a master image that represents the tone and color for the physical condition of the item at the time of digitization without correction of fading or exposure. The choice depends upon the goals and resources for the project, with the second option requiring more extensive resources to create and maintain large files that may never be used and include reference targets when possible. Both types of master images could be included in an archive. For a typical photograph with tones ranging from 0 for pure black to 255 for pure white, the darkest tones in an image should be set to 8 or higher and the lightest to 247 or lower. Fading is a pervasive problem with historical photographs and documents, and occurs with film as well as paper. Fading often induces color shifts because the dyes for different colors in photographic materials can fade at different rates. In addition to fading, a photograph may have excessive contrast, over or under exposure, or backlighting. Relatively routine adjustment of fading and exposure can make details in the image more visible and significantly improve the appearance of the image. These adjustments enhance rather than distort the information in the image. One strategy used for digital archive projects is to adjust fading and exposure in the master images. These basic adjustments are well established and can be done in a way that does not threaten the content of the image. This strategy focuses on the content of the images and requires minimal effort to prepare the image for display. An alternative strategy is to make the master images represent the exact condition of the item at the time of digitization without adjustments for fading or exposure. Adjustments for fading and exposure can be made later as copies are prepared for display. This strategy retains maximum information about the physical condition of the original item, but requires significantly more computer storage space and more effort. This strategy is required if a goal for the project is to have the capability to quantify, document, and investigate the deterioration of an item over time. The 2010 best practice document explicitly sets the goal that the master images precisely match the condition of the items at the time of digitization with no adjustment for fading or exposure. The 2003 and 2008 best practice documents do not explicitly take a position on this point, but the discussion of methods for tone and color adjustments includes the methods for adjusting fading and exposure. Figure 2.2 shows two master images for a photograph, one adjusted for fading and the other representing the current condition of the photograph. Figure 2.2. The image on the left is a master image adjusted for fading. The image on the right is a master image that represents the current condition of the photograph and does not correct for fading. A reference target such as this Tiffen Q-13 gray scale is included when possible in master images that represent the current condition of an item. Of course, image-editing software must be used to remove the reference target for most displays. If tone is also adjusted for display, the resulting image will be equivalent to the image on the left. This photograph of my father from about 1944 is a military portrait and therefore is public domain. The decision about the goals for tone and color adjustments is a fundamental parameter for an archive project. This decision is often related to the decisions about bit depth and what to include in a master image as discussed in Sections 2.8 and 2.9. For most uses of historical photographs and documents, precise recording of the faded condition of an item is not of value and adds significant cost to an archival project. These factors must be considered when making decisions about the goals for tone and color adjustments for an archival project. The methods for adjusting tone and color for fading and exposure are very different from the methods for representing the current condition of the item. The two sets of methods are described in separate sections below. The methods to adjust tone and color for fading and exposure for typical historical photographs are well established and are based on the content of the images. These methods are described in Chapter 3. They can be applied during the initial scanning or during a later step using image-editing software. In order to accurately capture the current condition of an item, the 2010 best practices document recommends that one or more standard color and tonal range reference targets are included when creating a master image. Tone and color are set based on the reference targets rather than the content of the image. These reference targets have a range of shades of gray and colors that can be used to determine the exact colors at the time the digital image was made. This is the most reliable method for assuring long-term precise color accuracy. A reference target for historical uses should have the exact identity of the colors and tones printed on the target or be sufficiently well established that the relevant colors will be known 50 years in the future. Many reference targets are available, but the needed long-term documentation may not be reliable. The Tiffen (previously Kodak) Q-13 target ($20 – $30) is one of the most well established and widely used reference targets for digitizing paper photographs and documents. The primary use of the Q-13 target is the grayscale card that is used to set the black, white, and gray points. These settings also correct most colorcasts. The color patches (red, green, etc.) on the Q-13 target are not sufficiently consistent to determine precise digital color values. Some other targets have more precise colors and are significantly more expensive. Reference targets that are used extensively need to be replaced periodically, in some situations as frequently as every month. As demonstrated in Figure 2.2, the size of the reference target is often not a good fit with a typical small historical item. This can greatly increase the size of the master image because the resolutions specified earlier are for the picture part of the image. One option is to cut the reference target into pieces and only include the key color patches in the image. That would reduce file size but also makes the target non-standard and less reliably used. In addition, modifications to the reference targets increase the effort and cost for the project. The methods for adjusting tone and color using reference targets are well established and are described in Chapter 3. The 2010 best practices document specifies that for the Q-13 gray scale card, the whitest patch (labeled A in Figure 2.2) normally should be set within the range of 239 to 247 or 3% to 6%, the blackest patch (labeled 19 in Figure 2.2) should be 8 to16 or 94% to 97%, and the mid gray point (labeled M) should be 100 to108 or 58% to 61%. Some exceptions to these recommendations are also noted. For example, if the image has lighter or darker tones than the reference target, the lightest and darkest tones in the image are set to the values above. In addition to large files due to the reference targets, even larger files may be needed to handle greater bit depth for more extensive adjustments later as described in the next section and in Chapter 3. The best practice documents suggest that access derivative or service master files can be made that have the reference targets removed and other appropriate adjustments. These files are used for virtually all purposes. In planning archive projects, the costs and benefits of creating and storing large master images that represent the current condition of the items must be weighed against the costs and benefits of basically keeping only the access derivative or service master images that are actually used in practice. Reference targets suitable for use with 35 mm slides are not available. The 2010 best practices document states that reference targets are generally not needed when scanning slides because most scanners handle slides reasonably well. Color management of the scanner as described in Appendix A would appear to be useful for creating images that accurately match the current condition of slides. Negative film has colorcasts that depend on the type of film and exposure, and, unlike slides and paper prints, the scanned image cannot be directly compared with the original item. Scanned images from negatives are usually processed to adjust for fading and exposure. The 2010 best practices document notes that scanning negatives is subjective, but recommends that an uncalibrated Kodak Photographic Step Tablet (about $110) be included in the scan with negatives. This is a strip of film with an array of densities that can be used to characterize the density on the negative; however, it is not useful for setting the tone and color for the master image. My expectation is that the potential benefits of using a reference target with negatives would not justify the additional costs and effort for the majority of historical archive projects. Whether or not the master image is adjusted for fading and exposure, the safest practice is to set the darkest and lightest tones in the output image to not quite be pure black and pure white. This provides greater assurance that the adjustments to tone and color do not remove content of the image and also provides a margin that may be useful for later processing of the image. All three best practice documents recommend that the darkest tones in an image be set to 8 or 9 or higher and the whitest tones be set to 247 or lower when the range of tone is 0 for pure black and 255 for pure white. In my experience these recommendations may be overly conservative for most images and wider ranges are generally acceptable. · Good practice is to make the main adjustments to tone and color using 16 bits per channel and save the output master file as an 8-bit grayscale or 24-bit color image. If a certain image will require extensive adjustments later then saving the master image as a 16-bit grayscale or 48-bit color image would be good practice for archival purposes. · Best practice is to save master images as either (a) 8 bit grayscale and 24-bit color if good tone and color adjustments are made using 16 bits per channel, or (b) 16-bit grayscale and 48-bit color. The second option is appropriate when the master images represent the current condition of the item and in other situations when significant adjustments are expected in a later step. Another option is to make two images, one that represents the current condition of the item and one that adjusts fading and exposure. After the main tone and color adjustments, both images can be saved as 8-bits grayscale or 24-bits color. The image adjusted for fading and exposure can be considered as a master image, or alternatively, as the first step of a working or service image (and can also include other adjustments such as infrared dust and scratch corrections discussed later). Bit depth determines the number of different color shades that can be applied to a pixel. For a grayscale image, each pixel has a number that represents a shade of tone from white to black. For a color image, each pixel has three numbers that represent the shade or amount of the three colors red, green, and blue. The two main options for bit depth are 8 bits and 16 bits. Bit depth is often referred to as bits per channel. For a grayscale image, 8 bits gives 256 different shades of gray between white and black, while 16 bits gives 65,536 shades. For color images, 8 bits gives 256 shades for each of the three colors red, green, and blue. This combination results in over 16 million different colors. Color images with 8 bits for each of the three colors are often referred to as 24-bit images. Color images with 16 bits for each color are often called 48-bit images and can represent over 256 trillion colors. Computer files with 16 bits per channel are twice the size of the same image with 8 bits per channel. In the finished image for presentation there is no benefit in having more than 8 bits per channel. The differences between color shades appear smooth and continuous to the human eye with 8 bits per channel when using the working color spaces recommended above. Greater bit depth does not provide additional useful information. Also, the vast majority of computer monitors and printers can resolve only 8 bits of gray or color information. However, 16 bits per channel can be valuable when images need significant adjustment. For example, when a faded image is adjusted to restore tone and colors, a narrow range of tone and colors must be expanded to a wider range. If the image has only 8 bits per channel, then gaps can occur when the tone and color are expanded. This can result in artificial bands of tone or color called posterization rather than smooth transitions. However, this degradation usually is only noticeable with more extreme tonal adjustments. Mild to moderate adjustments usually can be done without noticeable effects using 8 bits per channel. The section in Chapter 3 on output histograms provides more information about posterization. Once the major adjustment of tone and color has been done for a historical image, there is no practical benefit in having more than 8 bits per channel. Most current scanners work internally with 16 bits per channel and then save the output file as either 8 or 16 bits depending on user settings. As discussed in Chapter 3, the main adjustments to tone and color can be done with 16 bits per channel during the initial scanning or in a later step with image-editing software. If the master images represent the current condition of a photograph or extensive adjustments are expected for other reasons, then keeping 16 bits per channel is better. Professional level image-editing software may be needed to work with images with 16 bits per channel. For example, Photoshop Elements (through at least version 9) has limited processing of images with 16 bits per channel. Basic adjustments of tone can be done, which is the greatest need for 16 bits per channel; however many key functions are not available. Of course, the professional version Photoshop CS does fully handle 16 bits per channel. The 2008 best practices document recommends that master images be saved with 16 bits per channel, while the 2010 document recommends 8 bits per channel after the main adjustments for tone and color have been made with 16 bits per channel. The earlier 2003 document specified 8 bits per channel. Many writers who focus on artistic work with images recommend saving images with16 bits per channel because any image may have extensive modifications for artistic purposes. However, historically accurate images as discussed in this book are not intended for such extensive artistic modifications. · Good practice is to make master images that focus on the content of a photograph without borders and mountings. Including borders, mountings, and the back of an item is optional when there is writing or information on them. An item may have multiple master images. · Best practice is to either (a) make master images that focus on the content of a photograph without borders and mountings, but do include the borders, mountings, and backs of items when there is writing or other information on them, or (b) make master images that always include borders and mountings for the item, and include the back of the item when there is writing or other information on the back. An item may have multiple master images. Decisions must be made about whether borders of photographs and writing on the front or back are going to be included in the master images. These decisions depend on the purposes of the archival project and the resources that are available. There is not one practice that is best for all situations. The different options can be seen by looking at historical photographs on the internet. At present, the most common practice is to exclude photograph borders and mountings in digital master images. This conclusion is based on my experience browsing online collections of historical photographs. For example, the historical images at the Denver Public Library (http://digital.denverlibrary.org/index.php) and at the San Francisco Public Library (http://sflib1.sfpl.org:82/) use this strategy. This strategy provides an efficient, neat image that keeps the focus on the content of the picture. As usual with photographs, if a border is wanted for display, it can be added when the photograph is prepared or printed. Any writing on the border of a photograph can be noted in the documentation for the photograph. This strategy also minimizes the problems noted in Chapter 3 when attempting to adjust tone and color for images that include borders. The second most common practice is to include not only all photograph borders and mountings but also an additional surrounding area that shows all the edges of the original photographs. Examples of this strategy include the online photograph collections of the U.S. Library of Congress (http://www.loc.gov/pictures/) and the Museum of the City of New York (http://collections.mcny.org/MCNY/C.aspx?VP3=CMS3&VF=MNY_HomePage). This strategy captures and documents that all possible information of any kind on the photograph is included in the master image, and is generally used when the goal is to capture the current physical condition of the photograph without adjustment for fading. With the first strategy, it is optional whether the information on the back of a photograph is only noted in the documentation or is also scanned as a separate image. With the second strategy, information on the back of a photograph is typically scanned as a separate image. While fixed rules or policies can be defined for a given project, my usual practice is to be more flexible and adapt these decisions to the particular item being digitized. I generally do not include borders in the master images. If there is simple writing on a border, I will note that in the documentation for the photograph without including it in the master image. However, if the writing on a border is unclear, complex, or has parts done by different people, I will include the border in the master image. If I think that working with the image with the borders will be difficult, I make a second master image without the borders. However, in many cases the border has faded along with the picture and including the borders does not present difficulties. A similar strategy is used for writing on the back of a photograph. Simple writing is noted in the documentation, but a separate image is made for more complex cases. An image made primarily to capture written information on the front or back of a photograph can be made at a lower resolution than the main image for the photograph. Either of the two strategies or a flexible combination of them can be considered best practice. The first strategy focuses more on the content of a photograph and the second strategy places a higher priority on the exact physical condition of the original item. Many flatbed scanners do not scan a narrow strip along the edges of the scanning bed. When this inappropriately cuts off the edge of a photograph or document, one or more cards can be used as spacers to align the edge of the photograph or document parallel with the edge of the scanning bed. Three by five inch cards often work well for this, or narrower spacers can be used. Attempting to accurately align the edges without using spacers frequently results in slightly rotated images. In cases when a certain small part of a photograph will be wanted separately from the overall picture, I often make a second master image that isolates the smaller part. For example, Figure 2.3 is a close-up image of the two people in Figure 2.1. Having the close-up available is more efficient than deriving it when needed. Also, making the close-up directly from the original provides optimal quality, particularly when a high degree of enlargement is required. Similarly, when a large part of a photograph is not of interest, I often make a lower resolution master image of the entire photograph and then make another higher resolution cropped image. This provides both optimal display of the part of the picture that is interesting as well as the entire original picture for the full context. Figure 2.3 In addition to the full picture shown in Figure 2.1, a separate close-up master image of Alexander Switzer and his daughter is also useful. The close-up is scanned at a higher resolution than the full picture. Switzer fought in the Civil War when he was 15 years old and came to Kansas to homestead with his wife and two small children when he was 23. The sod house he first built washed away during a thunderstorm. 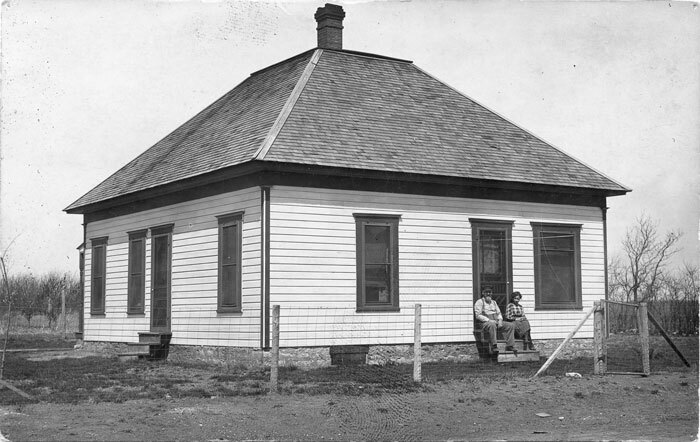 After eventually developing a successful farm, he sold the farm and focused on developing the town of Yoder. For photographs with significant detail and the camera conspicuously out of level, I sometimes make a second scan with the photograph rotated to be level. Unfortunately, amateur photographers often hold the camera out of level. Using image editing or scanning software to rotate the photograph at an odd angle (not 90 degrees) will slightly soften the image compared to making the original scan with the image at the desired angle. The amount of softening decreases with increasing scanning resolution, but can be noticeable when details such as very small print are being examined with substantial enlargement. · Good practice is to apply infrared dust and scratch corrections for a master image. The results are carefully checked if the infrared corrections are sometimes unreliable with the scanner and software. The documentation for the master image should state that infrared dust and scratch corrections were done. · Best practice is to make two images, one with and one without infrared dust and scratch correction. The results are carefully checked if the infrared corrections are sometimes unreliable with the scanner and software. Both images can be considered to be master images, or alternatively, the image with corrections can be considered to be the first step of a working or service image (and may include other adjustments). The documentation for the master image should state that infrared dust and scratch corrections were done. Infrared dust and scratch correction is an extremely useful technology. A spot on an image may be black because there is a speck of dust or because the actual image is black in color at that point. These two cases cannot be distinguished with the visible light that is used in scanning. However, when infrared light is shined through a negative or slide, it will pass through a spot that is a true color on the image but will be reflected from a speck of dust or a scratch. Once the dust and scratches have been identified, software can correct them by making the spot consistent with adjacent areas. Digital ICE is one of the popular software programs for implementing infrared dust and scratch correction. Infrared dust and scratch correction offers a unique opportunity to make corrections at the time of the initial scan. This precise identification of dust and scratches cannot be done at a later step in processing the image. Infrared dust and scratch correction works primarily with color negatives and slides. It does not work with most black and white negatives and generally not with reflective scans from paper photographs. For some scanners and software, infrared dust and scratch correction does not work well with Kodachrome slides. There is great variability in the implementation of infrared dust and scratch corrections. It works very well with my Nikon 35 mm film scanner, but not as well with flat bed scanners. In fact, with my Epson V500 scanner, Digital ICE causes significant degradation in certain images. In general, infrared corrections should be monitored carefully, particularly if a flat bed scanner is being used. The best practice documents do not specifically address infrared dust and scratch correction. The use of infrared dust and scratch correction may or may not be appropriate for an archive project. It would appear to not be appropriate when the master images represent the exact condition of the item at the time of digitization. Unfortunately, this means a unique opportunity to identify defects in the image is not utilized. A conservative strategy is to keep two images, one with and one without the infrared corrections. My usual practice is to routinely use the infrared dust and scratch correction with the Nikon 35 mm film scanner. With other scanners, I carefully check the infrared corrections on each image. If a negative or slide has extensive damage or damage to key parts of the image, I will make two master images, one with and one without the corrections. Good and best practices for scanning documents are summarized in Table 2.3. Color is used when color is important to the interpretation of the content and is optional for documents that are one color of writing on a background. Grayscale can be used when it captures the information in the document. Color is used whenever there is color in the writing, in the paper, or in damage for a document. Grayscale is used only when the document is black and white without damage that has color. sRGB for color and whatever is the default for grayscale. Adobe RGB for color and Gray Gamma 2.2 for grayscale. 300 ppi when all the writing on the document can be easily read. Greater resolution if enlargement is needed to easily read some of the writing or enlargement is expected for display. 600 ppi for doubled size and 900 ppi for tripled. Minimum of 400 ppi. Also at least 4000 pixels on longest side, unless the document is small and substantial enlargement is not expected. Greater resolution if enlargement is needed to easily read some of the writing. High or medium quality JPEG is acceptable, particularly when a large number of images are produced with no adjustments to the master images. As described in section 2.7 above. Letters and cards are the most common historical documents, but other documents range from ticket stubs and small membership cards to large signs and posters. The size of the writing on a page may vary and the digital image needs to have adequate resolution to easily read the smallest writing. Documents may contain pictures and may have multiple pages. Documents such as diaries may have hundreds or even thousands of pages. A collection of letters can also easily require hundreds of images. The decision whether tone and color are or are not adjusted for fading applies as described in section 2.7 above. Documents usually have a much smaller range of tone and colors than photographs and less detail. As described in Chapter 3, documents usually require manual adjustments of tone and color. Scanning with black paper behind the item may be beneficial if writing on the backside shows through. Minimizing the effort and overhead is important when a large number of images are involved. When hundreds or thousands of images were made for documents, I have used color master images with sRGB color space and JPEG format. This provides adequate quality for documents, with reduced overhead and reduced overall effort. The difference in file size between color and grayscale images is much less for JPEG than for TIFF. Color images are usually a good option for JPEG files. The methods for batch processing described in Appendix E can be very useful for processing a large number of images with similar properties. Archiving documents directly from word processing or desktop publishing software without scanning is discussed in Section 2.18. Most scanning software comes with various default options set to automatically make adjustments to the scanned image. Virtually all of these automatic default options need to be turned off or modified for archival scanning. They are usually set to make images for display on the internet or for printing, and typically produce unwanted effects such as significant clipping of the content of the image. The options that are applied should be specifically set for archival scanning. The Guidance on Using Scanning Software at http://archivehistory.jeksite.com/chapters/scan_part1.htm describes the settings for using common scanning software for historical archives. Special adjustments to a master image may be appropriate in certain circumstances. For example, Nikon film scanners produce sharp scans with a type of lighting that is noted for over-emphasizing grain in film, particularly with black and white film (Blatner, Chavez, Fleishman, & Roth, 2004, page 19). As discussed in Chapter 5, optimal adjustments to reduce film grain require special software that is not built-in to Photoshop (at the time this is being written). The scanning software that comes with Nikon scanners contains the Digital GEM grain reduction method that works well with Nikon scanners. A mild application of this method reduces the harshness of the image without loss of useful detail and would be appropriate for preparing master images for most historical projects. The use of Digital GEM with Nikon scanners is described in the Guidance on Using Scanning Software, Part 4 at http://archivehistory.jeksite.com/chapters/scan_part4.htm. Another technique that may possibly be useful in certain situations is to take multiple readings from the scanner. In theory, reading each pixel multiple times and using the average of the readings should reduce noise from the scanner and would be particularly valuable for images with detail in dark areas. In practice, my experience and the experience commonly reported by others has consistently been that multiple readings do not produce noticeable benefits. In fact, some methods for obtaining multiple readings tend to make images significantly softer. However, the theoretical benefit from multiple readings is clear, and it is possible that this method may be useful with certain scanners for certain types of images. Scanning software often has options for taking multiple readings. · For paper and other reflective originals, most recent scanners can make archival images that are adequate for both good and best practices. · For medium format film, mid-level consumer scanners can make archival images that are adequate for good practices. Higher quality scanners are more appropriate for best practices, and particularly for professional photographs. · For 35 mm film, a high-end consumer scanner such as an Epson V750 can barely make archival images that are adequate for good practices. Higher quality dedicated film scanners are needed for best practices for 35 mm film. The advertised resolutions for scanners usually are seriously misleading. The advertised resolution is based on the properties of the light sensor, but the actual useful or effective resolution is based on the combined operation of the light sensor, electronics, optics, mechanical components, and software. Effective resolution is discussed in Appendix C and is usually much lower than the advertised resolution. The effective resolution typically matches the specified resolution setting for a scanner up to a certain point and then the effective resolution starts falling far below the specified resolution. The useful effective resolutions for most recent scanners are adequate for scanning typical paper photographs and documents. The effective resolutions are usually not adequate for 35 mm film, and are a mixed bag for medium format film. As discussed in Appendix C, an Epson V750 scanner can barely meet the resolution criteria for good practice for 35 mm film but cannot meet the criteria for best practice. The V750 can handle the best practice resolution criteria for medium format film. The Epson V500 scanner can meet the resolution criteria for good practice for medium format film and for best practices for some sizes of medium format film. However, the V500 cannot meet the minimal requirements for 35 mm film. The website Scandig.com provides useful, objective reviews of scanners. The reviews typically report the disparity between the advertized resolution and actual maximum effective resolution, but unfortunately rarely provide information on what resolutions can be used reliably. Appendix C provides more detailed information on the useful resolutions for scanners. Another important parameter for scanners is the density range, which is the range between the lightest and darkest points that can be distinguished by the scanner. In general, the need for a greater density range can be ranked from low to high starting with paper photographs, negative film, typical slide film, and high quality slide film. Here too the advertized density range for scanners usually exaggerates actual performance. In practice, actual density range is often correlated with effective scanning resolution. For medium format black and white negatives by amateur photographers, a mid-level consumer scanner such as an Epson V500 or V600 produces images that are not noticeably different than images created by more expensive flatbed scanners. My comparisons of the same medium format negatives scanned with an Epson V500 and with an Epson V750 Pro scanner found no noticeable differences. The Epson V750 scanner is more flexible with regard to film size. Some negatives do not fit in the standard medium format negative holder on either the V500 or V750. For these cases the V750 has a setting for negatives to lie directly on the glass without a holder. The V500 does not have such a setting, but scanning the negative directly on the glass without the holder produces images that are only slightly out of focus at very high enlargement. A high quality dedicated film scanner such as the Nikon 9000 can be expected to produce better images than a flat bed scanner for medium format film. The difference would be most noticeable with photographs by professionals. Nikon film scanners produce noticeably better results for 35 mm film than any available flatbed scanner. As described in Appendix C, the effective resolutions for flatbed scanners are not comparable to dedicated 35 mm film scanners. Nikon film scanners easily meet the resolution criteria for best practice. Unfortunately, Nikon has stop manufacturing film scanners and the limited market for film scanner makes it unlikely that other companies will develop high-end film scanners. Used and refurbished Nikon scanners can be found. Other film scanners are currently available that may be useful in some situations, but the reviews should be carefully studied. These tend to have significant compromises. One of the best options may be to hire the scanning of 35 mm film. Local scanning services may be available as well as services from the internet. Verifying reliable handing of historical items and clear understanding of the archival scanning requirements are important when using a scanning service. There are two options for digitizing items that are larger than the scanning bed on a flat bed scanner. One option is to digitize the items with a camera. That option is described in the next section below. The other option for large items is to make two or more scans and use image-editing software to combine the images into one large image. Photoshop Elements and Photoshop CS have remarkably effective tools for aligning and combining images. The sections are scanned with overlapping areas in the different scans. The Photomerge option in Photoshop Elements or Photoshop CS identifies the overlapping areas in the separate images and merges the images into one large image. The recommended optimal amount of overlap in the images is about 40%, but good results can be obtained with less overlap. I have used this with documents that required two or four images and have had very good results. Photomerge is initiated in Photoshop Elements with the dropdown menu File>New>Photomerge Panorama. In Photoshop CS it is initiated with File>Automate>Photomerge. The Photomerge dialog box allows browsing and selecting the image files that are to be merged. Once the files are selected, click the Ok button and Photoshop will combine the files into one image. The final image has each component image on a separate layer and will usually need to be flattened as described in Chapter 3. A digital camera is the most common option for making digital images of items that are too fragile to scan or too large. Old bound books easily can be damaged by scanning. Although any item that can be scanned can also be photographed, most people prefer to scan when that option is available. Scanning gives much more control and allows adjustments that cannot be made directly with a camera. Each image from a camera requires more extensive work with image-editing software. In addition to digitizing historical items, a digital camera may be used to make images of recent events that will be of historical value in the future. The decisions about color mode, color space, resolution, and bit depth apply with a camera and the same criteria are used. The default size of the image will not match the original item when a camera is used and adjustments for fading must be done in a later step. These types of basic adjustments, including cropping the image, must be done with image-editing software. The best practice is to set the master image size to match the size of the original item. Good practice is to record the sizes of the originals in the documentation for an image and change the default size later only if needed to reproduce the original size. The resolution settings for cameras are described in terms of total pixels on each side of the image rather than pixels per inch. Cameras are categorized according to the maximum total number of pixels in an image. A useful guideline is that a 6 or 7 megapixel image is needed to have 3000 pixels on the longest side and an 11 or 12 megapixel image is needed to have 4000 pixels on the longest side. The possible settings for resolutions on a camera are limited to fixed values. At present, a digital SLR camera or camera with a similar large sensor is needed for good quality archival images. Point and shoot cameras usually have smaller electronic sensors and poorer optics that are not comparable to SLR cameras. The resolution and megapixel ratings for cameras do not reflect actual image quality unless the size of the electronic sensor and quality of the optics are considered. Squeezing a lot of pixels on a small sensor is not comparable to the same number of pixels on a larger sensor. With present technology, an APS sensor as found in digital SLR cameras is generally considered the smallest size suitable for archival images. However, guidelines such as this are subject to change as new technology is introduced. One situation where a point and shoot camera might be acceptable is digitizing small books such as personal diaries (e.g., each page about 3 inches by 5 inches) that have relatively large, clear writing. A digital medium format camera can produce the best results but the prices are currently beyond the range of most people or organizations with budget limitations. Those without budget limitations will want to consider this option. Another option is to purchase a digital camera back that converts a medium format film camera to a digital camera. A digital SLR camera corresponding to 35 mm can produce good quality images for archival purposes. A minimum of 12 megapixels are needed for standard sized documents, and greater megapixels are preferred for oversize or highly detailed photographs or documents. Many cameras do not produce TIFF files as output. The common options are RAW and JPEG. RAW images are directly from the camera sensor with little processing. The main processing to produce the final image must be done in a later step with Photoshop Camera Raw or with software provided with the camera. Working with RAW images provides the maximum control but also requires the greatest expertise and time. RAW images are proprietary and are not suitable for archival purposes. After the image has been processed, it can be saved in TIFF format. Those with advanced amateur or professional skills with Photoshop and available time may find working with RAW images to be optimal. Knowledge of batch processing is important if hundreds of images are involved, as occurs when making images of the pages in books. Processing RAW images is not covered in this book. Those with less interest and experience with Photoshop or with time constraints will probably want to let the programming built into the camera do most of the processing for an image. This can produce very good results but will often mean accepting JPEG files as output. For digitizing photographs or complex documents with fine print, use the highest quality JPEG that the camera can produce. The JPEG files should be converted to TIFF when editing is done. As noted earlier, JPEG is a compressed format that looses information each time the image is re-compressed. Most image-editing software will re-compress and slightly degrade the image each time the image is saved after modifications. Repeated editing of the image can cause significant degradation. The amount of degradation in the initial JPEG file is not noticeable with good SLR cameras. The original JPEG files can be used as the master images, or the JPEG files can be converted to TIFF for the master images. Whether the initial digital image is in RAW, JPEG, or TIFF format, basic processing with image-editing software is typically needed. The processing can include rotation, cropping, setting the size, adjusting tone and color, conversion from color to grayscale, and conversion to TIFF. Batch processing is the most efficient way to make the conversions if many images are involved. It is important that the original items and camera are positioned very consistently if batch processing is planned. Appendix E describes batch processing of images. Certain software can perform lossless rotation, lossless cropping, and lossless changing of ppi for JPEG images. These processes do not re-compress and degrade the images and are very useful when the master images are JPEG from a camera. (JPEG images from scanners will normally have proper rotation, cropping, and ppi.) For example, the free IrfanView image-viewing program provides these lossless operations and includes batch-processing capabilities. Lossless JPEG operations with IrfanView are described in Appendix E.
A camera copy stand with lights is needed for good archival images of paper items. A copy stand can be purchased or one can be developed at lower cost. Fragile books are best digitized with a book cradle that does not open the book flat. Appendix D describes options and guidelines for obtaining and using copy stands and book cradles, and also describes the basic processing with image-editing software. Each digital image should be checked to verify that significant errors were not made. This is best done as a separate step after the image is created. The ideal practice is to have the quality check done by a person who did not create the image. A different person performing the quality check would be expected when digitization is done by an institution. When the person doing the quality check also created the image, good practice is to do the quality check in a separate session. The settings that need to be changed for different images are important to check. These include cropping, resolution, and tone and color adjustments. Verifying proper handling of working color space in master images is also valuable, and is very important when the working color space is Adobe RGB. Documents may need to be archived directly from word processing or desktop publishing software. The usual output files from software such as Microsoft Word or Adobe InDesign have proprietary formats that are frequently updated and are not appropriate for long-term archives. PDF is currently the most common format for long-term archives of these documents, but XML and RTF are also sometimes recommended. None of these options is as widely accepted and as consistently implemented as the TIFF format is for archiving images. The software for implementing PDF, XML, and RTF currently tends to have compatibility problems for complex documents and often involves complicated, esoteric options. The reliability of accessing these documents over a period of several decades has significant uncertainty. A PDF file can contain text, formatting specifications, and images. The properties of these internal components can vary greatly and may be optimized for small file size rather than for long-term archives. Unfortunately, the options and details for these internal components are not easily identified and controlled, which can make archiving precarious. The PDF/A format is intended specifically for long-term archiving. The PDF/A‑1a variety is for word processing and similar documents with text and formatting as well as images. It is the optimal option, but usually must be properly applied at the initial conversion to PDF. The PDF/A‑1b variety is for images without text and formatting, such as from a scanner. It is also used in the frequent situation that an existing PDF file cannot be successfully converted to PDF/A-1a. Newer varieties with additional features have been developed as PDF/A­‑2 and PDF/A‑3. At the time of writing, software is not widely available for reliably handling these emerging varieties of PDF/A. When PDF/A is used, the software creating the PDF file should be carefully managed to make sure that the resolution and compression of images are appropriate and are not inadvertently altered during the creation of the output file. Also, numerous internal properties can be inconsistent with the PDF/A standards. Specialized software, such as certain options in Adobe Acrobat Pro ($400 – $450), is needed to verify compliance. It is likely, but not certain, that PDF files will remain accessible for 50 years even if they are less formally handled. Optical character recognition (OCR) can be used to create word processing documents from scanned or photographed images of typed documents. This can create much smaller files and allows the files to be searched for certain words, but usually does not precisely match the formatting and fonts of the original document. OCR of historical documents tends to have errors and requires significant effort to make corrections and to verify accuracy. Another option for PDF files from scanned documents is to apply OCR to produce text that is hidden in the PDF file, but can be searched for particular words. This option is prone to unrecognized errors in the hidden text that can give misleading results. Additional information on the use of Adobe Acrobat Pro for PDF files and for OCR, and the use of ABBY FineReader for OCR is provided in documents that can be downloaded from the website for this book at http://archivehistory.jeksite.com/download/download.htm. BCR, 2008, “BCR’s CDP Digital Imaging Best Practices Version 2,” (which is an update of the 2003 Western States Digital Standards Group best practices document below and was developed by a reorganized group). Currently available at http://archivehistory.jeksite.com/download/bcr_2008_best_practices.pdf. Blatner, David; Chavez, Conrad; Fleishman, Glenn; & Roth, Steve, 2004. Real World Scanning & Halftones, Third Edition. Published by Peachpit Press in Berkeley, CA. Federal Agencies Digitization Initiative (FADGI) - Still Image Working Group, 2010, “Technical Guidelines for Digitizing Cultural Heritage Materials: Creation of Raster Image Master Files.” Accessed February 12, 2011 at http://www.digitizationguidelines.gov/guidelines/FADGI_Still_Image-Tech_Guidelines_2010-08-24.pdf. McHugh, Sean, no date, “Working Space Comparison: sRGB vs. Adobe RGB 1998.” Accessed June 21, 2011 at http://www.cambridgeincolour.com/tutorials/sRGB-AdobeRGB1998.htm. National Archives, 1998, “National Archives Preservation Guidelines for Vendors Handling Records and Historical Materials.” Accessed April 29, 2011 at http://www.archives.gov/preservation/technical/vendor-training.html. Warda, Jeffrey (editor), 2011, The AIC GUIDE to Digital Photography and Conservation Documentation, Second Edition. Published by The American Institute for Conservation of Historic and Artistic Works in Washington, DC. Western States Digitial Standards Group, 2003, “Western States Digital Imaging Best Practices Version 1”. Currently available at http://archivehistory.jeksite.com/download/wsdsg_2003_best_practices.pdf.